Fantastick Patrick is The One Man Circus Band! 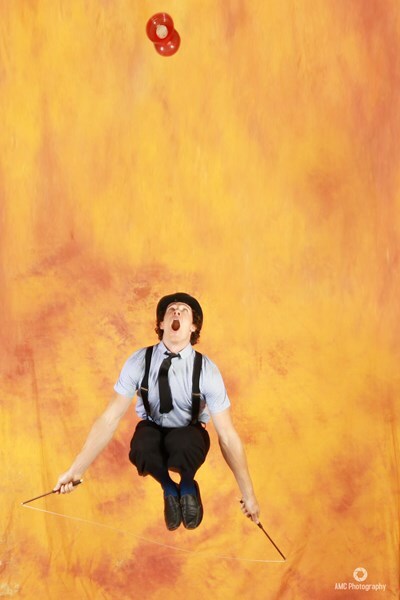 Fantastick Patrick's masterful blend of circus skills and comedic timing has led to international success in venues world-wide, plus television appearances on The Tonight Show with Conan O'Brien, Hell's Kitchen on FOX, the MTV movie awards, and more. The Fantastick Patrick Show is perfect for Community, Private, Corporate, and School events, with humor appropriate for each audience. Need a fun Team-Building event? Fantastick Patrick will have your group in stitches as they work together. 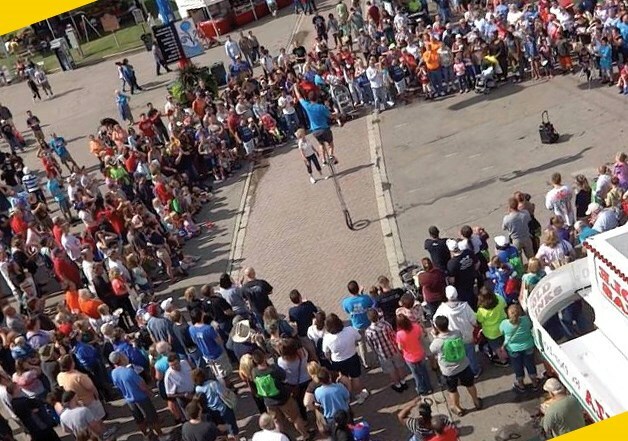 Fantastick Patrick can also provide strolling entertainment for your event, festival, or trade show. Give your guests the gift of Fantastick Patrick! Warning!!!! I would like to warn anyone who wants to book him for an event. Your guests probably will skip the dinner!!!. Seriously, the show was so awesome that people even forgot to eat the dinner. It was a great experience, not just for the kids but for adults as well. Patrick was involving everyone in the audience irrespective of their age. He was so entertaining that people were cheering all the time. Really, it was a great evening. Patrick got some serious fans for his show last evening. Again, Thank you Patrick for making my son's first birthday a memorable event for everyone. My production company worked with Fantastick Patrick in a crunch to do ridiculous juggling stunts for a comedic film short (It involved wearing a dinosaur suit while tossing fire batons). Patrick is GREAT. He was responsive to all our questions and concerns even before we paid a deposit, And on set he maintained a friendly and cool energy amidst the chaos of a behind-schedule, high pressure film shoot. Also, the guy is just especially talented at what he does; whereas other performers were hesitant or unwilling to do the tricks we needed, Patrick was essentially like 'Yea, I got this', And he delivered on that 100%. Everyone on set was wowed. I HIGHLY recommend. Patrick arrived on time, was professional, engaged the crowd (especially the children), and overall gave a great performance! We will definately have him at our events in the future. amazing show Great customer service wouldnt hesitate to book him again ! Offered to do our event free as Rock & Star (for the publicity). When 1/2 of the group backed out, Fantastick Patrick agreed to do event solo. We were straight forward and honest about our venue; we put his logo and information on all of our publicity information, as we were requested to do. I received an email the day before our event that he would not provide entertainment, due to lack of stage(which was never requested). Unprofessional; wasted a lot of time corresponding about their "needs" for this preschool fundraiser. I gave him 1/2 star for talent because the system requires a rating (but obviously I can't rate his talent, as he cancelled last minute). Please note Fantastick Patrick will also travel to Alhambra, Bell Gardens, Glendale, Huntington Park, Maywood, Monterey Park, Bell, Hollywood, Pasadena, South Pasadena, Montebello, South Gate, Burbank, Beverly Hills, Inglewood, Rosemead, San Gabriel, San Marino, Culver City, Downey, El Monte, Lynwood, Pico Rivera, Toluca Lake, Universal City, Willowbrook, Compton, La Canada, Montrose, North Hollywood.